GBP/USD – Gunning for 1.73? Today, the British pound rose to its strongest level against the U.S. dollar since October 2008. Despite the lack of hawkishness in the Bank of England minutes, more U.K. officials joined the chorus of policymakers hinting of an earlier rise in rates. This morning Ian McCafferty from the BoE said the central bank should not hold back rate hikes for too long and begin raising rates before the output gap is fully closed. With his comments we now count no less than 3 U.K. policymakers (Carney, Weale and McCafferty) as proponents of an earlier rate hike and with more likely to follow, its no surprise to see sterling extend its gains. The question now is whether sterling has enough momentum to hit 1.73. From the perspective of monetary policy divergence, sterling should have enough momentum to climb to its next resistance level, which is near 1.7350, the 50% Fibonacci retracement of the 2007 to 2009 decline. However in order for that to happen, we need a catalyst. There is no major U.K. economic reports scheduled for release next week but Carney will be speaking again on Thursday and the BoE will be publishing their Financial Stability report, which could provide more guidance on how the U.K. government could use fiscal and monetary policy to reduce stimulus. If the central bank successfully convinces the market that they are moving closer to raising rates, sterling could find its way towards 1.73 – but in all likelihood it will be a slow drift higher. The main resistance zone for the GBP/USD is between 1.7040-50. While the currency pair broke through this zone today, it ended the North American trading session right near it, which means that it has not experienced a clean break. 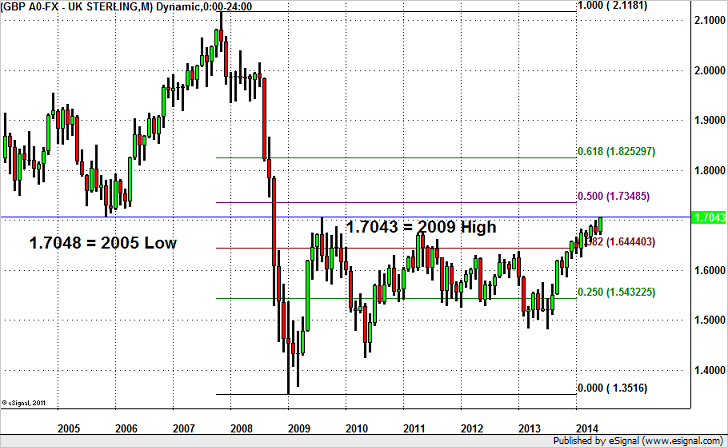 Technically, we really need to see GBP/USD close above 1.7050 to open the door for a stronger move to its next resistance level near 1.7350, the 50% Fibonacci retracement of the 2007 to 2009 decline. We think this will happen eventually but if GBP/USD fails to close above 1.7050 in the next 24 hours, a deeper retracement is possible for before a stronger move higher.